Herbal Product, AcaiBerry, Alfalfa, AstragalusRoot, Ashwagandha, Bilberry, Boswellia Cream, Boswelliac, Cat's Claw, Cleanse, Dong Quai, Echinacea, Evening Primrose Oil . AcaiBerry (Euterpe oleracea) is grown in Brazil and some parts of South America. People have been using for as dietary supplement for controlling appetite and weight. Alfalfa extracts are one of nature’s most densely packed nutritional foods available. Alfalfa has enhanced anti-oxidant enzyme support properties, including Superoxide Dismutase and Catalase. Astragalus - known to the Chinese as huang qi and on this side of the Pacific as “milk vetch root” - has demonstrated striking results in stimulating the immune system. In fact it is one of the most powerful herbal immune system boosters known. Aswagandha (Withinia Somnifera) is a popular herbal tonic not only in India, it has become a super herbal supplement for consumers in America and Europe . It is a substitute Ginseng and acts as an energy provider. Bilberry(Vaccinium myrtillus) may act as a herbal supplement for healthy eyes. Boswelia with Curcumin (turmeric) may act as a herbal nutrient for various joints according to Ayurvedic of India where people have been using for centuries. Recently, Curcumin has become very popular in western countries. It may contain natural antibacterial therapeutics. Cat's Claw(Uncaria tomentosa) people have been using as a tonic herb in Peru for centuries. It is special herbal formula designed for colon cleansing.It is a mild laxative. There is no adverse effect as it is a food supplement. It has been used as most preferred female tonic in the Orient while ginseng has been the more traditional for male adaptogen. Echinacea(Echinacea purpurea) herbal supplement may be May Helpful for cold. Evening Primrose Oil(Oenothera caespitosa) It is a dietary and nutritional supplement for vegetarian individuals. Feverfew(Tanacetum parthenium) It may be good a supplemental dietary product for joints. Garlic may act as a good nutrient for our cardio vascular health as well as as a supplement for joints. 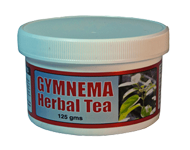 The Gymnemic acids in Gymnema herbal tea prevent the taste buds from being activated by any sugar molecules in the food. Ginkgo as a food herbal supplement may be May Helpful to increase the circulation to the brain and memory loss. Caution: Pregnant woman should not take ginkgo as a supplement.